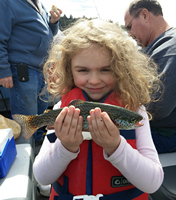 Jones Sportfishing - We fish the Columbia and Snake Rivers for salmon, steelhead, walleye and sturgeon and our goal is a first class experience on these world class fisheries. We accommodate anglers of all skill levels and love to share our passion for the outdoors with our customers! What a nice day Tuesday was for fishing. There was little to no wind on the river and the temperature was in the lower 60's. The whitefish cooperated too. The two of us brought home a total of 22. We had enough hits and lost fish to catch our limits. We drifted from Whitefish Island to the power lines in 15' to 20' of water. Most of the hits came in the upper part of the drift. We used orange yarn eggs soaked with salmon egg oil scent. If you like to fish for whitefish now is the time. View other reports from GordyC. Whitefish island is the area halfway between vernita bridge and the dam. An island forms there frequently when the water levels fluctuate. Its an area thats all river rock. You can't miss it. What i did last year was launch at the bridge and motor up to whitefish island and turn the motor off and drift with the current to the power lines. Rinse and repeat. Boat is not necessary as i've seen plenty of bank anglers knock the crap out of them. Gear was a 7ft rod spooled with 8lb test line. Simple drift rig setup. Sliding pencil lead weight with 3 foot leader. On the business end was a very small egg pattern fly or yarnball tipped with a fake rubber egg or fake maggots. They are a blast to catch and taste great smoked. Easily catch a limit of 15 in a few hours. I will be fishing for them end of november and into december. Thanks. That "island" shows up on Google earth if you have the right date selected. I tie my yarn egg patterns on #6 hooks. Orange and red orange colors works best for me. I don't tip the hook with rubber eggs or fake maggots. I squirt on generous amount of salmon egg oil scent. Once the whitefish puts the yarn egg in its mouth it doesn't spit it out. Thank you that is all some great info! !